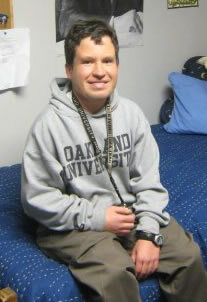 Micah is part of the new wave of adults with intellectual disabilities attending college (www.thinkcollege.net). Since first grade, when he told his parents he wanted to go in the same door as all of his friends, he has been fully included in his school, community, and now on a college campus. While in high school, he was active in many clubs, ran cross country, chosen to be on the Home Coming Court, and awarded the Social Studies Department Award for his civic involvement. He was also actively involved in planning and participating in all of his Individualized Education Plan (I.E.P.) meetings. In 2001 he was selected to participate in the Michigan Youth Leadership Forum and in 2002 in the National Youth Leadership Forum. He has been a proud and active National Board Member of KASA (Kids as Self Advocates) (www.kasa.org) for the past six years, and is a member of a Teleconference Education committee with the National Youth Leadership Network (www.nyln.org). Micah is currently interning with the Michigan Rountable for Diversity and Inclusion (www.miroundtable.org). Micah enjoys presenting at conferences on advocacy, post secondary education, and self determination, and his experiences learning and living on a university campus. He has presented in several states across the country for groups and conferences including People First, PEAK Conference on Inclusive Education, Partners in Policy, Office of Special Education Programs (OSEP), International Parent to Parent, TASH, Arc, NCIL, NYLN, Family Voices, Council of Exceptional Children (CEC) as well for transition conferences, college classes, parent groups, and middle and high schools. To learn more about Micah's two year struggle to move into the dorm, click here. Read about Micah's inclusive journey at the SpecialQuest blog: Inclusion! What's In It For Everyone? mission of MPAS is to advocate and protect the legal rights of people with disabilities. Micah's mom, Janice Fialka, MSW, ACSW, is national speaker on issues of inclusive education, secondary transition, siblings issues and ways to strengthen the parent-professional partnership. Micah's sister, Emma Fialka-Feldman is a student at Mount Holyoke College who writes and speaks on topics including sibling issues, the"r-word" (retard) and inclusive education. 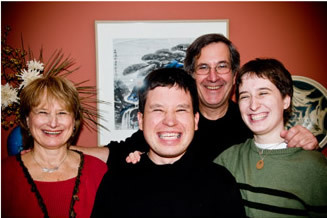 Micah's dad, Rich Feldman, is a community-labor activist and writer. Not to be afraid to ask for help. Asking is a good thing and builds community. My friends can help me and want to help me. There are always people who want to rally behind a good cause about justice. Ask them to get involved. A good way to spread the word about an important cause is by talking to lots of people, having forums, speaking up at Board meetings, talking to administrators, and contacting the media. Don't be afraid. You have an important message. People will listen but I have to say it out loud or write about it. To keep fighting--- no matter what blocks my road. How to talk to people who might not agree with me. I know it is important to listen and talk about what I believe. Sometimes things will not go the way I want, but I still have to stand strong. Change doesn´t happen over night. My disability is a part of who I am. It is important to know disability history & culture. I am disabled and proud. Technology and computers are very important ways for me to communicate and learn. (I use the program Dragon Naturally Speaking). I need to have dreams and find ways to achieve my dreams. It is a good idea to think “outside the box”.